The perfect Gretsch drum set to kick off a career in drums. The Gretsch Catalina Maple series starts with the Gretsch maple formula shell. Gretsch carefully developed the maple shell specification to produce tones that explode with attack and volume and project a balanced amount of warm, low-end frequencies. 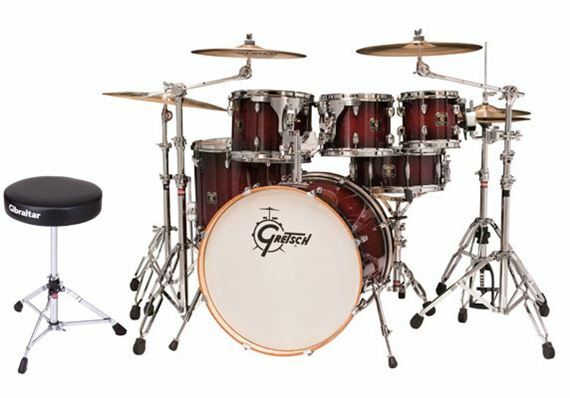 Gretsch Catalina Maple 5 Piece Shell Kit Drum Set Features Gretsch mini-GTS suspension system maximizes tone and includes Gretsch 9020-style tom bracket Gretsch maple formula shells - All feature 7ply, 7.2mm with 30-degree bearing edges Classic Gretsch 4945-style drum mount plate Gretsch tom holder has 12.7mm arms with memory locks and flexible multi-positioning All Catalina Maple shells are 7-ply, 7.2mm. The shells are equipped with Gretsch Classic features and hardware, including 30-degree bearing edges, fully-adjustable Gretsch ball-and-socket tom holder with 12.7mm tom arms, 9020-style mounting brackets and their famous 5-lug configuration (a standard Gretsch feature for over 50 years) for all 10 and 12 inch toms. All drums feature a multi-step lacquer process that produces an extremely glassy-smooth finish that is hard and durable. In addition, Gretsch partnered with Evans drum heads to produce a distinctive Gretsch by Evans batter and resonant head combination. Drums are easy to tune and produce full tones right out of the box. Shell Kit only, Cymbals and Cymbal stands sold separately. Click Here to see our Huge selection of cymbals. Click Here to see our Drum Hardware Packages.